What does it say about me that at this point, cannabis products tend to land on my desk on a near-daily basis? Quite simply, that I'm an L.A.-based wellness editor in 2018. And to be clear, you probably don't have to live in California (or Colorado or Washington) to notice that marijuana is hitting the mainstream in a big way. As legalization continues to sweep the country, movers and shakers in the beauty and health industries are capitalizing big on the plant's many health benefits—as well as the fact that it's no longer considered as taboo to adopt a pro-pot lifestyle. By residing in one of the most weed-friendly and wellness-oriented cities in the country—truly, the New Yorker in me still feels like she's part of some weird social experiment in which crystals are as ubiquitous as pocket change and people are more inclined to talk about their astrological forecasts than the weather—I've had the opportunity to experience many of these hybrid brands and products firsthand. 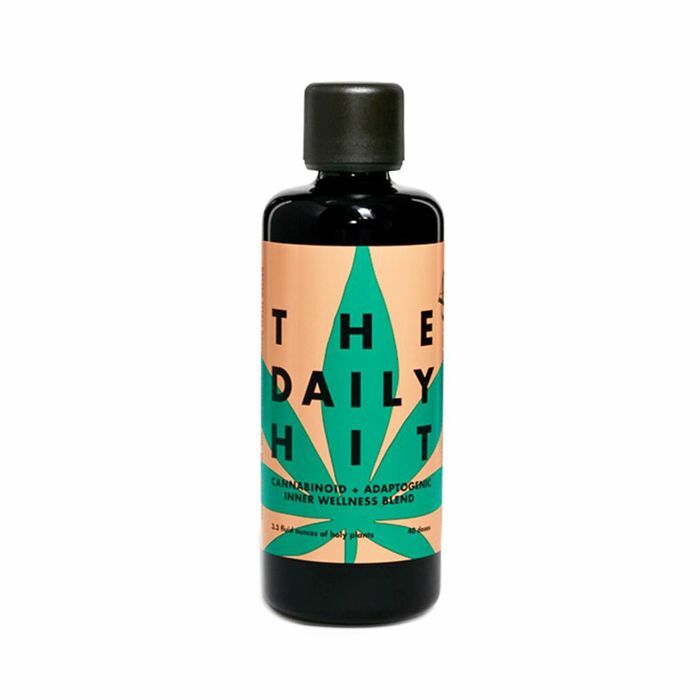 Case in point: When my friends at perennially cool natural beauty destination CAP Beauty invited me to try out The Daily Hit ($96), the brand's new adaptogenic herb–infused CBD oil—at a morning yoga class, no less—I was more than game. That was last summer, and six months later, I'm still riding the high of that particularly blissful Vinyasa flow. That "high," of course, is proverbial: As a refresher, CBD (short for cannabidiol) is a non-psychoactive cannabis compound that nonetheless has been shown to have a marked impact on inflammation, anxiety, and other conditions. This winning combination has made CBD a highly accessible and thus wildly popular solution in the weed-wellness space. 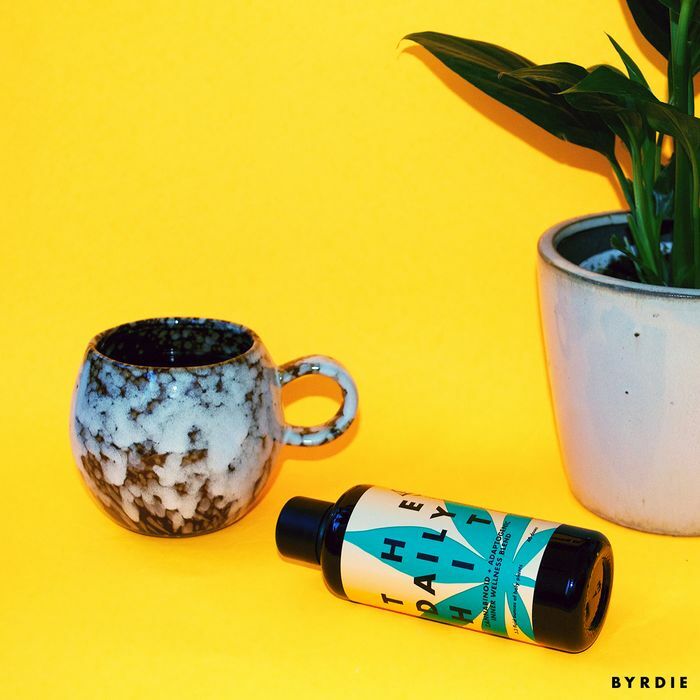 Not to mention versatile: CBD has popped up as a starring ingredient in everything from muscle salves and sprays to cramp-alleviating suppositories to yes, multitasking oils. Which brings me back to The Daily Hit: While the idea is to use it as you would any other kind of cooking oil, I like to mix it into my morning coffee like a high-vibe version of Bulletproof. The effect—which won me over the first time I tried it at that yoga class—is exactly what I need in the morning. I need a lot of caffeine to function on a daily basis, but this habit also tends to exacerbate my anxiety. The CBD oil somehow takes the edge off so that I'm still energized and focused but also feel miraculously mellow. I can probably attribute some of this to the blend of adaptogens that The Daily Hit includes as well: reishi, schisandra berry, and mucuna pruriens are all shown to regulate cortisol, the stress hormone that caffeine has a tendency to throw into overdrive. All this bodes extremely well for my morning productivity—and on days when I've been between bottles, I've noticed that the edgy, spaced-out feeling returns. While coffee is definitely my preferred method of consumption, It's also worth noting that the oil has a toasted, nutty flavor that's absolutely delicious on its own—I love it on salads, and I've also been known to ingest it by the spoonful. (I have a "no caffeine after noon" rule, but sadly my anxiety doesn't abide by the same stipulations.) That said, it's not cheap, so I try to stick to the recommended serving size of half a teaspoon per day. The bottle typically lasts me a couple of months, so I feel like it stretches my dollar (especially when considering the fact that it's a high-quality brain-boosting supplement).